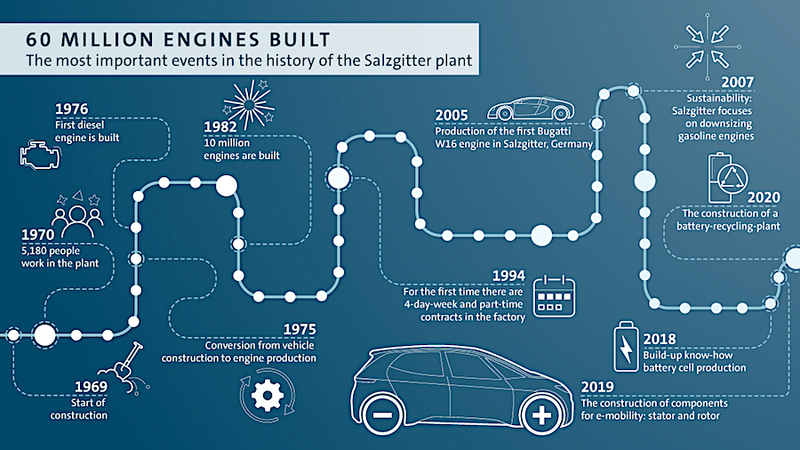 Volkswagen has been actively promoting the electric push by creating global production capacities for the construction of one million EVs. VW has been actively promoting the electric push by creating global production capacities for the construction of 1 million electric cars. Late last year, it announced it would spend nearly $50 billion to refocus on the making of electric cars, autonomous vehicles and new mobility services. Late last year, Germany set aside more than $1 billion to support domestic production of battery cells, and there’s been talk of a national consortiumthat may include Volkswagen. The news comes a couple of days after the world’s largest maker of battery cells, China’s CATL, announced it planned to produce 60 gigawatt hours(GWh) beginning in 2026 from its battery factory in Germany, its first production site in Europe. VW will develop its final generation of vehicles using combustion engine technology in 2026. Recent studies show carmakers will need to add EVs to their sales lineups to meet the new European Union rules on greenhouse gas emissions from 2021. They also highlight how German carmakers need to rethink their business as the growing adoption of EVs is expected to cost the country’s key auto industry about 75,000 jobs by 2030, according to a report carried out by the Fraunhofer Institute of Industrial Engineering. Those figures, the institute said, were calculated on the assumption that by 2030, a quarter of all vehicles on Germany’s roads will be fully electric. Another 15% is expected to be hybrids, which combine an electric motor with a traditional internal combustion engine, and 60% of the cars will be powered by gasoline or diesel engines that are more fuel-efficient than today. BMW recently said raw materials needed for car batteries will grow 10-fold by 2025, adding it has been surprised by “just how quickly demand will accelerate”. BMW plans to offer 25 electrified vehicles by 2025 and, like many of its peers, it prefers nickel-manganese-cobalt batteries or NMC. EV pioneer Tesla’s favoured battery technology –nickel-cobalt-aluminum or NCA – already uses less than 3% cobalt.